Strawberry Shortcake is such an iconic character – how could anyone not love her gentleness, her lifelong friendships, and her happy presence? 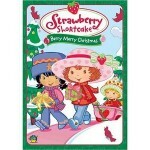 In this holiday special, Strawberry Shortcake wants to pick the perfect gifts out for everyone. While she does pick all the great things she wants to give people, her gifts are ruined on her way back home! On top of all of that, she’s missed some of the tree trimming because she was out shopping so late! Filled with songs, heart-warming friendships, and lots of merry, this holiday show will definitely make a great addition to your collection.